Compact, lightweight, and reliable handheld GPS receiver. Compact, lightweight, and reliable handheld GPS receiver. Includes an electronic compass and barometer. Lacks a touch screen, but touch screens are ineffective in bad weather. 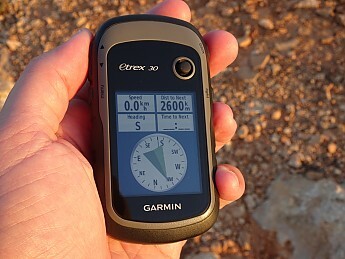 The Garmin eTrex 30 is a battery-powered handheld GPS unit. It has been around for a long time, and at first sight it looks old-fashioned. Its display screen is small and is not touch-sensitive: you control the unit using buttons on the sides and a joystick on the front. Having said this, I’m not sure that a touch screen is a good thing. A handheld GPS unit must be capable of use in all weathers: indeed the eTrex 30 has an IPX7 waterproof rating, meaning it can withstand up to 30 minutes of immersion in water one metre deep. Judging by my experience trying to use my mobile phone in the rain, a touch screen becomes a liability in wet conditions. Garmin eTrex 30 showing trip computer style display. The display can be customised and is easily visible in sunlight. The joystick on the eTrex 30 doubles up as a button. A downside of this arrangement is that the joystick/button can accidentally be pressed when the unit is being carried in a pouch or pocket. It’s not the first time that I’ve finished a walk and discovered that the unit had recorded several unnecessary waypoints along the way due to accidental button-presses. I’ve had my eTrex 30 for three years, but I can’t say I have used it to its full potential. There are features I haven’t used and probably others I’m not even aware of, so this is by no means an exhaustive review. 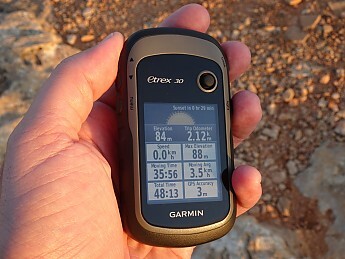 I’ve basically used my eTrex 30 to navigate, to record routes I walk, and to gauge the distance I have walked. Most of the navigation I’ve done using my GPS has been in the limited sense of knowing where I am and comparing this with my paper map or guidebook to figure out where I need to go. But in May 2016 I walked a long-distance route in England’s Lake District using my GPS as my main navigation instrument. 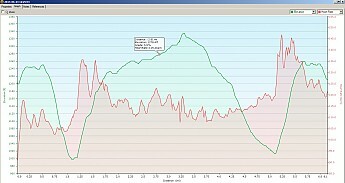 I had downloaded the route to my GPS as a series of gpx files. The eTrex 30 performed very well in this role. It beeps every time you reach a waypoint on the programmed route, so you don’t have to keep checking the unit constantly for reassurance that you’re still on track. I ran into problems only once, where the gpx route simply took a straight line between two waypoints and led me off the trail. But this was the fault of the gpx file, not my eTrex. 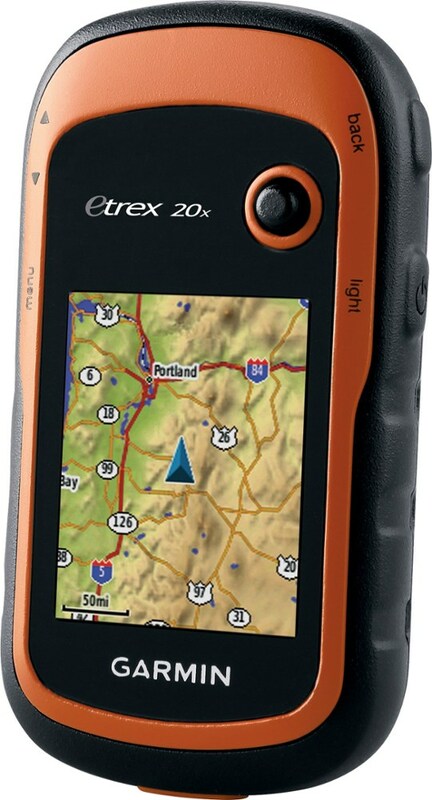 The eTrex 30 is basically similar to the eTrex 20, but with the addition of an electronic compass and a barometer. The compass tells you what direction you are facing even if you are not moving, unlike an ordinary GPS unit which calculates your direction from your movement. You can use the compass to navigate towards a pre-set waypoint. 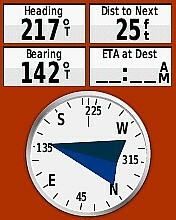 The eTrex 30 will give you a bearing for the waypoint and tell you how far away it is. The barometer can be used either to track changes in atmospheric pressure or to measure your altitude. GPS units derive altitude data from satellites, but this is unreliable, which is why the eTrex 30 supplements satellite data with barometric altitude. However, barometric altitude is not that reliable either. It is affected by changes in ambient air pressure. There were occasions when I did a circular walk and got an altitude reading at the end of the walk that differed substantially from the one I had obtained from the same spot at the start of the walk. In the end I disabled barometric altitude and opted to rely on satellite altitude data alone. Technically, you can use the eTrex 30 barometer to keep track of the weather at your campsite: if air pressure drops, bad weather is on the way. But this would mean keeping the unit on overnight and using up its batteries faster. I have a Casio PRG270 solar watch which is much better for this purpose. It is solar-powered so I don’t have to worry about battery life, and moreover it beeps a warning if barometric pressure changes substantially—something the eTrex does not do. Whether the Casio’s beep is loud enough to wake me at night is another matter. The eTrex 30 is compact and lightweight. It weighs 147g (5.2oz) including batteries. This is the plus side to the small screen. I carry my GPS and my camera in Deuter pouches—excellent pieces of gear which can be mounted on the belt of your trousers or the shoulder straps of your rucksack. I keep both devices on my shoulder straps for easy access. When it rains my camera disappears into a rain jacket pocket, but my GPS stays on my shoulder. I have kept my eTrex for hours at a stretch in the rain in an increasingly soaked pouch, frequently taking it out to refer to it, and it has worked perfectly. I have found little difficulty using the joystick and buttons with my waterproof gloves on. The eTrex can use GLONASS as well as GPS satellite systems. When you turn on the eTrex 30, it is quick to get a satellite fix—certainly much faster than my camera, which has its own GPS receiver. I have never known my eTrex to lose satellite contact except when I enter a building. The only problems I have had with reliability were in the early days, when my eTrex would occasionally give me an impossibly high distance reading for a walk I would have done. But this stopped happening after a while. The unit has had a number of software updates, and perhaps these have made distance readings more reliable. In May 2017 I set out on a long-distance trek in Scotland and although the unit had a UK map loaded, it refused to display it. It showed my track on a blank white background. Switching the unit off and on solved the map display problem and it did not recur, either during my Scottish trek or subsequently. The eTrex 30 is powered by two ordinary AA batteries. It connects to your PC via USB using a dedicated cable (the port on the eTrex is non-standard), but this is for data transfer only. It would be nice if I could use my portable charger to recharge all the devices I carry with me on a long-distance trek, but this is not possible with the eTrex and there's no alternative to carrying spare AA batteries. I have found battery life on the eTrex 30 to be reasonable, with the proviso that, as already mentioned, I keep it on only while walking. During the eight days of my Scottish trek I only needed to change the batteries twice. All in all I'm happy with my eTrex 30. There are newer models on the market, but I'm not planning to upgrade. Great review, Charles! Thanks so much for taking the time to share it with us. Thanks both. Vladimir, that Tempe sensor looks interesting. 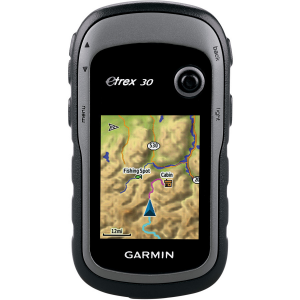 The Garmin eTrex 30 is a versatile, featured loaded, budget friendly GPS. It has many of the bells and whistles of the nicer models, but with a much better price. 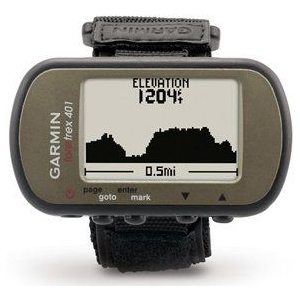 I've been using some form of the Garmin eTrex series for many years, according to my geocaching account I've been a member there since 2005, which is around the same time I received my first Garmin eTrex Legend. Since that time I have been a huge fan of the eTrex series, owning the original Legend, a Legend H, Venture Cx, Legend HCx, a 20, and now the 30, as well as other makes and models. 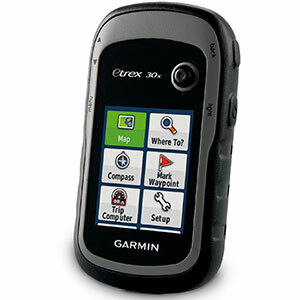 The Garmin eTrex 30 is a color screen geocaching friendly unit, displaying info for paperless caching. Including a list of the geocaches, types, difficulty and terrain ratings, descriptions, recent log entries, hints, and you can log whether you found it or not and a short description of your found/not found to upload later when you get back to your computer. This feature works with the more popular geocaching.com site, as well as Garmin's own opencaching.com website. Premium features of the Garmin eTrex 30 include a barometric altimiter, tri-axial compass, wireless sharing, ability to add a heart rate monitor, speed/cadence sensor, tempe sensor, and can work with the Garmin Chirp technology. If these features aren't of interest to you, you can save even more cash (about $75 - $100) by dropping down to the eTrex 20. Other features include Auto-Routing with additional maps, which cost an additional fee to purchase and are limited to one unit. There are some free option out there as well. I don't use my eTrex for Auto-Routing though, so I can't really comment on that. I do know that it is not a voice read auto-route, you only receive a beep and on screen message. You will also find options to save or follow a track using the GPS. A track is essentially a way for the GPS to save or follow "bread crumbs" so you can know where you have been or where you are going along a trail. Save features for this include automatic, time, and distance. So, when you aren't using the auto-save option you can program is to save a point ever x number of seconds, or after every x number of feet down to 0.01 miles (about 53 feet). Garmin claims the GPS can handle 200 saved tracks with 10,000 points each. It also includes several waypoint options as well. You can save a waypoint, either by quick saving with a push and hold of the joystick on the front of the GPS, average the waypoint for a more accurate location fix, or project a waypoint to another location. 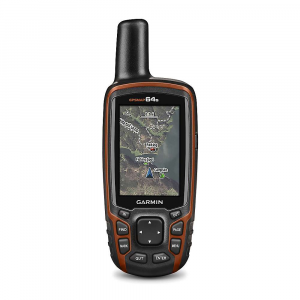 You can also load and navigate to a waypoint by either manually inputting the point in by hand, or by transferring the information from Garmin's Free BaseCamp software available on their website. You can also use the GPS to view and navigate to photos that have been geotagged with GPS coordinate information, so someone can send you directly to that beautiful view they photographed and you're dying to see in person. The eTrex 30 can find and maintain an accurate location due to it being able to calculate positions from both US based NAVSTAR satellites, as well as the Russion based GLONASS satellites. This gives the GPS several more satellites to choose from when calculating a position, so it will almost always have a good number of satellites overhead to pick from. The GPS also picks up the Wide Area Augmentation System or WAAS, a correction issued to reduce inaccuracies caused by atmospheric interference. The included base map that comes with the GPS is pretty useless however. Luckily, Garmin does sell several different maps including 100k and 24k topographic maps that can be loaded directly to the GPS, as well as street maps like you find on the Nuvi Car Navigation units. Those of course are at an additional cost. Even luckier for us, there are actually many great FREE maps available from site like GPSfiledepot.com. I have downloaded the free 24k topographic maps from that site and easily loaded them to my GPS using the Garmin BaseCamp software. As I mentioned earlier, there are also free street maps on the internet at other sites that will allow you to do automatic street routing, but I have not used those maps and do not know how accurate they may be. I have used the eTrex 30 for about a year now, and a year prior to that I used the eTrex 20. 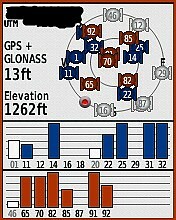 I use GPS units fairly often for both hobby and work. I've been using the eTrex series for several years now and I have never been let down. I believe they are a great reliable GPS unit. The size makes them easy to fit in your hand, and with additional mounts available (caribiner clip that slips on the back, bike mount, marine mount, Auto-Friction Mount, after market RAM mount) it can be carried almost anywhere on any vehicle or backpack. I would and have recommended this GPS to several of my friends. If you are looking for more bells and whistles, Garmin makes other GPS's with nicer items, such as pre-loaded topo maps and built in cameras. Those of course cost a bit more. 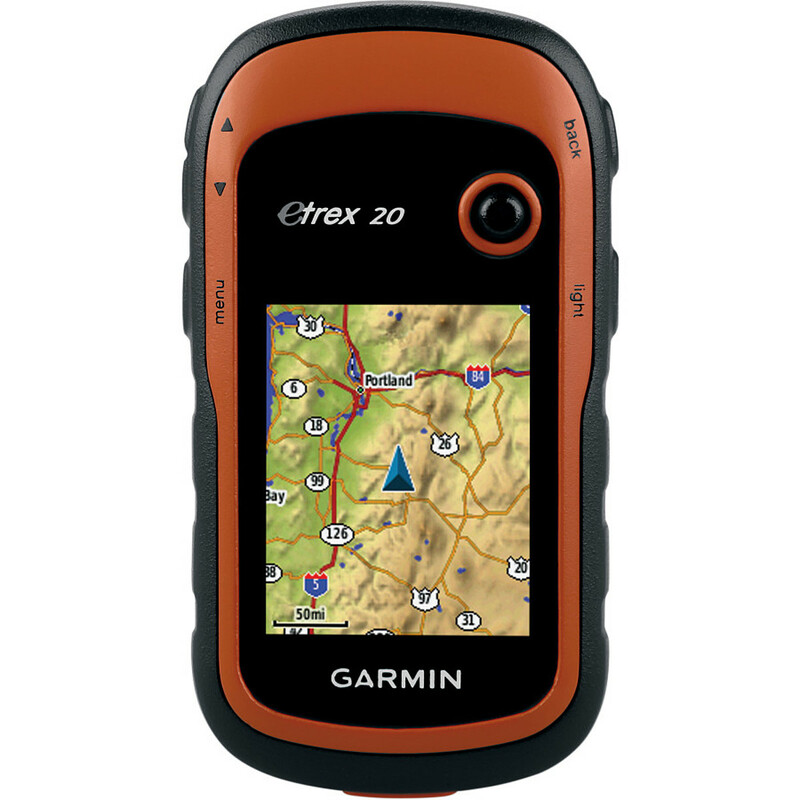 Also, if you want a nice GPS and want to spend less they have the eTrex 10 (black and white) and eTrex 20 models. Both great GPS's. Don't go in to the mountains without it. 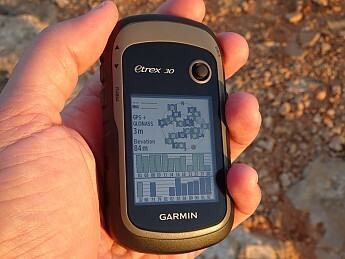 I use my Garmin eTrex 30 from hiking/backpacking to 4-wheeling and every other time I head up to the mountains. I received this as a gift and have been using it for almost a year now. There are a lot of great features that this device has from basic GPS and compass, trip computer, waypoints to area calculations, clocks/alarms, proximity alarms, sight 'N go, you name it, it seems to have all the bells and whistles. I use the trip computer every time I go out to log my trip. I have it set to tell me my current elevation, Trip odometer, Total time, my heading, Total ascent, current location (longitude and latitude), Barometer (great for keeping an eye out on the changing weather conditions, and time of day. It has many other items you could select, in fact it took me an hour or so to determine the ones I wanted to use. It is very easy to change out the items so it is very customizable. Some of the features can be a little confusing. First, off this is the first GPS I have ever used, so that might come into play some, but it took some time to understand the function of the features and I have not mastered them all by any means, still a work in progress. I have connected it to my computer a few times to plan out routes and trips that I can store on my GPS for later use. I purchased the Colorado and Utah Topo map pack. The standard map pack was not very useful for the mountains or just in general. These packs can be pricey I paid about $90 dollars for my map pack, but it was worth it. It is very accurate for a commercial GPS and has hiking trails on it. The hiking trails at times can be a little off from my active route (which basically leaves a bread crumb trail on the map, so you back track) but nothing that would be any cause for concern. This GPS is compact and fits in my belt pocket on my pack, for easy access. I have been looking at some attachments to secure it to my pack though because when it is my pack pocket buttons sometimes get pushed. I haven't had it reset or anything like that, but more of just a personal preference. I have dropped it a few times by accident but it didn't seem to harm the GPS, screen is still fine and no scratches/cracks. Just had to wipe the dirt/mud off it and put it back in my pack. I was never a big fan of GPS's in general, but now that I have this one, I would not leave it behind. It is the first item I put in my pack when I go out. Having never been truly lost in the mountains, I have not had to use it a survival tool (thankfully), but if I did I would have plenty of faith in it to get me back to a trail, road, or town. Thanks for the review. My hesitance with GPS units is the weight & the dependency on batteries. That's why I only carry a map & compass. But then Illinois "wilderness" areas are a bit less wild than out west. 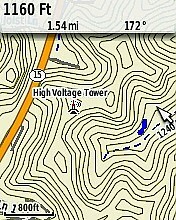 I haven't had any battery issues with mine so far (knock on wood) but I always carry topo maps and a compass as well. I usually use the maps and the GPS together, haven't had to bust out the compass in a while. Thanks for the review, crblank. I hope you'll keep us posted on how this continues to work out for you. 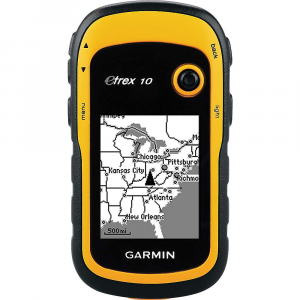 I am only weighing in on eTrex as to use of it without buying the expensive Garmin map subscriptions. It has worked fine as it was able to synch with Google Earth when the data is downloaded to my laptop. However, Garmin basecamp, which is the program to download from your device to a computer, will no longer work with Google Earth. 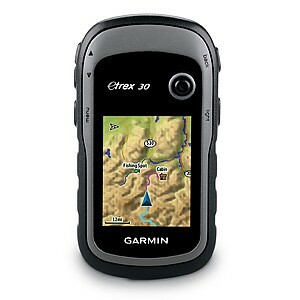 The support team at Garmin tells me that I must use Garmin maps. I bought the device not wanting the map subscription and because it worked with Google Earth. Now it is a no-go. Will no longer interface with Google Maps. The device may be wonderful if you buy the map subscriptions. I bought it because it worked well without a subscription. Now without warning they no longer interface with Google Earth via their Basecamp software. They recommend I buy the Garmin maps. Thanks for the update on this, Sid. Sorry to hear about the negative changes. Welcome to Trailspace, Sid. Thanks for sharing this info for others. Check out gpsfiledepot for free maps. The highly rated ones can be very good. Reliable route finding GPS with great graphics, however its weight and limited battery life make it better for geocaching than backpacking. This was given to me as a gift and I was very excited since I'm a big fan of Garmin's Zumo motorcycle GPS. In spite of some great features, I'm glad I didn't spend $300 USD on it. I've found the accuracy to be good in the backcountry, and the track back feature works flawlessly. I also like the setting that automatically inserts way points into your route as you travel. I've had the eTrex soaked in a rainstorm without any damage so while it may not be waterproof, it is water resistent. It's also tough — I've dropped it on a steep, rocky trail with no damage other than a few scratches and nicks. I have not been able to successfully installed maps from other providers without losing important data such as trail numbers, graphics, and waypoints. I'll gladly admit that it might be a user error, but spending 2 hours plus trying to load a non-Garmin map only to have missing data doesn't speak highly of how easy it is to use. The preloaded base map is fine for navigating highways, but it isn't going to do you any good in the backcountry. Unfortunately, Garmin offers only two trail maps under $25 USD and neither of them are for hiking (one is equestrian and the other is whitewater). Garmin's trail maps are accurate but expensive. Finally, the eTrex is too heavy for backpacking, especially if you have to carry extra batteries for extended trips. I would suggest brushing up on your backcounry map reading and navigation skills and carry a paper TOPO map and a compass. If you're base camping and venturing off trail in the backcountry, you could also use a much smaller, lighter, and inexpensive track-back device. You'll lose graphics but it will get you back to camp. It's a scam. When you pay $150 for a GPS you expect at least it would ship a decent map with it. But, no, it came with a map that doesn't even show road to your home. Okay, maybe that was a bit harsh. I think the unit is quite sturdy, and the satellite acquisition is fairly fast. It's one unit, provided you carry enough batteries, that can get you home. Every time I read about someone gotten lost and died on the trail, I always asked, why did not he or she invest in a GPS. This is my investment for that purpose. But, my opinion about the lack of free maps remains the same. The Basemap on the Mac works better than the one on Windows for me. I was finally able to get it to send txtopo11 to the unit. It's a scam. When you pay $150 for a GPS you expect at least it would ship a decent map with it. But, no, it came with a map that doesn't even show road to your home. When you try to load a map to it, it's so difficult it made MS-DOS of the early 1980s look simple. This is the very last Garmin I would ever buy. I have a Nuvi that cost half as much, but at least it came with a full U.S. map that can be used driving around the country. The eTrex 30 is just a scam. Hey Patrick, this is a hiking gps, you're able to download topographical maps and other hiking related maps normally for free from online sources. Road maps aren't the purpose of this unit. Garmin includes basemaps preloaded with some of their units but expect to pay three hundred plus for those. If seeking to navigate the backcountry and find your way home, turn on the tracks feature it pings the satellite every few meters or whatever setting you put it one and creates a layer showing where you have been. If needing it to tell you where to go. Set the coordinate system to WGS 84 and find your destination on Google earth, using the pin allows you to see the coordinates, set that as a waypoint on your unit and it will work like a homing beacon, telling you how far and the general direction of where to go. And remember, if it tells you to go straight but you are on a winding trail. The best decision maker of how to handle that is you.